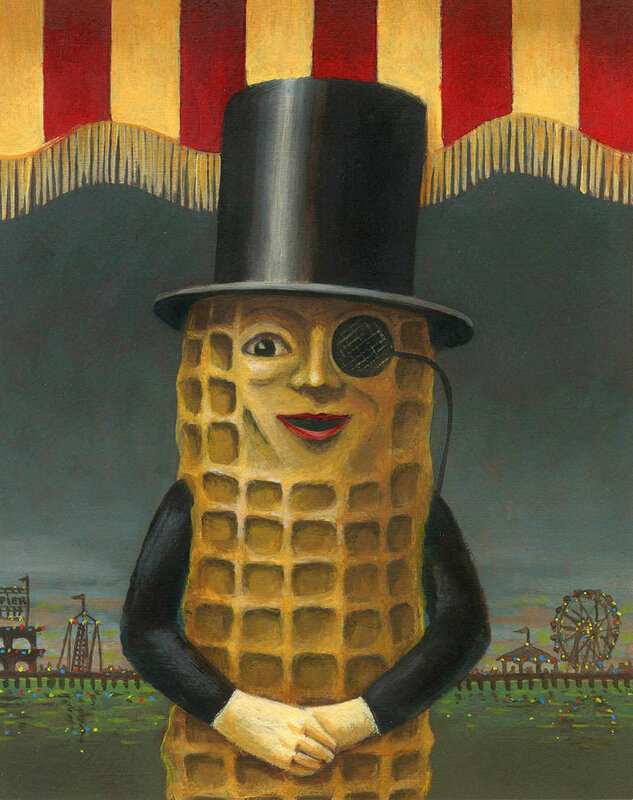 I have been fascinated with Mr. Peanut ever since I first encountered him as a young child on a trip to Atlantic City with my father and sister. It was a magical day on the boardwalk, long before the casinos arrived. On Steel Pier I remember watching a woman on horseback diving into the water, taking a sepia toned photo with my sister inside a make believe jail where we were holding my father prisoner and another where we were poking our heads through carnival cutouts. We even went down under water in the mysterious diving bell! Anyone familiar with vintage Atlantic City will surely remember these amusement park wonders. What sticks out most in my memory however, was walking past the Planters Peanut shop and seeing black spindly legs with spats and slowly looking up to see a gigantic peanut man towering above me: head silently bobbing back and forth with dark holes where his eyes should be. It was terrifying but for some reason instead of being traumatized by this experience, I instead became fascinated to the point of obsession as the years went by. I collected Mr. Peanut ephemera and even had the chance to design a vintage Mr Peanut print for Nick & Nora pajamas years later licensed by Planters that remains one of my all time favorite prints. it’s neighboring towns and boardwalks during the glory days of the Jersey Shore. Have a great end of the summer. Don't forget the ice cream. You can read more about Mr Softee's portrait here. My portrait of Uncle Omelette was recently featured in the Manhattan User's Guide in their Food and Drink section and I couldn't be more pleased! He was included in a group of wonderful selections from Etsy, all with a vintage kitchen theme. Manhattan User's Guide is a fantastic site that emails you daily with just about everything you need to know about what is going on in New York City, all five boroughs! In my opinion they have great taste and a terrific sense of humor. You can read more about the creation of Uncle Omelette in my blog post "Uncle Omelette: Creepy Food Icon or Ideal Husband?". Prints are available in my Etsy shop Curious Portraits! Uncle Omelette: Creepy Food Icon or Ideal Husband? I just finished this painting and thought I ought to do a post about it. Apparently Uncle Omelette is frightening people (if my friends reactions are any indication) and I am trying to understand why. I suppose the somber colors and his inscrutable expression might be a factor. I admit that Anthropomorphic Food, one of my favorite subjects, can be a little creepy to some. I thought that telling the story of how the portrait came about would perhaps make the subject seem a little more friendly. Originally this was going to be a portrait of Humpty Dumpty who seemed the perfect subject to be included in my series of anthropomorphic food icons. One night during a bout of insomnia (when many of my best painting concepts appear) I had the idea that he shouldn't be sitting on a wall, as he is often portrayed, but should be shown doing something domestic, to sort of show Humpty Dummpty "at home". It occurred to me that it would be funny if he was cooking bacon since he is after all, an egg. The painting then evolved into the second sketch. I was even going to paint him in bright, vintage kitchen colors with a pistachio green wall and vintage pot holders hanging in the background. I began the painting as I always do with a grisaille underpainting using brown and white to block in the light and shadow. At this point I became distracted with other projects and put the painting aside for about two months. A week or so ago I decided it was time to work on it again. I know that sometimes when I let a painting sit too long I lose my train of thought. I felt strongly about this particular portrait and thought it deserved to be finished. I began to add in glazes of color and it became clear to me that all the background elements were unnecessary. The slightly green background against the burgundy shade of his suit felt almost flemish to me. I found the contrast of this formal painting style with the absurd subject matter very exciting. I knew that the painting was nearly finished. When I look at Uncle Omelette I see a kind, caring face. The fact that I named him "Uncle" (something that again came to me during a sleepless night) made him seem immediately familiar. Cooking for someone, in my opinion is a very caring act; in my family it is the best way to show people you love them. So in my imagination, Uncle Omelette is a benevolent and loving family member who is trying to take care of me. That being said I must also add in that according to my friend Danielle, because I am often attracted to bald men and am always saying that I would love a chef as a partner, this is actually a portrait of my ideal husband. I may like her interpretation the best! I love to cook and particularly love to bake. I am always jotting down a new recipe idea on scraps of paper or printing them out from Epicurious but when I find that a recipe becomes a favorite I love going through the ritual of writing it out on a fresh new recipe card and filing it away into one of my vintage recipe boxes. There is something so satisfying about it, as if I am giving it my stamp of approval. I know how much I treasure my Mother's recipe cards written in her own hand that stood the test of time. Mostly they are worn at the edges and stained from use but that gives them their charm and meaning. How sad it would be for future generation to miss out on that piece of history. I know I am not alone in this as there are many adorable recipe cards to be found especially on Etsy. I have also found some fun ones that are free to download from The Graphics Fairy, one of my favorite sites for vintage ephemera. I have used many existing recipe templates that I have downloaded over the years and recently decided to design some of my own. I started out with 6 images per set (2 of each) from my each of my anthropomorphic food prints which are vintage inspired. I am offering them for sale in my Etsy shop The Curious Kitchen as they go along with their matching kitchen towels and prints. I thought photographing them in my kitchen along with some of my vintage recipe boxes would be appropriate. The one below even features the salt shaker I used for the print! Are you having a bad day? Are the pressures of everyday life getting you down? Then let these cheerful anthropomorphic bottles help! We have anti-depressant and anti-anxiety pills topped off with a nice bottle of vodka, just what the doctor ordered... Seriously though, this is a parody of the golden age of Mad Men when it seems everyone was popping Seconal and Phenyl Barbitol and drinking heavily to boot. Think of it as a nostalgic romp through the 1950's and 1960's! Prints are available at The Curious Kitchen. Who can lure you away from temperance better than a juggling cocktail shaker, a strutting bottle of vermouth, a dancing martini glass and a jolly bottle of gin? My fascination with vintage anthropomorphic food continues with this homage to the most classic of all cocktails, the revered martini. Prints of this original watercolor painting are available now at The Curious Kitchen for 20% off if you type in the coupon code "Cocktails" at checkout! Do we really need friendly little anthropomorphic desserts to encourage us to go off our diets! Of course we do! Who can resist the allure of the Cannoli Girl or the Eclair Man? Certainly not Myself. Dancing macarons, tumbling petit fours and chocolate covered strawberries in love just make me smile. This is the newest addition to my Anthropomorphic Food series. Prints are available in my Etsy shop The Curious Kitchen along with mini print sets of the individual food people! I am happy to say that my Mr. Peanut portrait now has a new anthropomorphic food companion in the form of Mr Softee! When my sister, my cousins and I were kids Mr Softee held a special place in our hearts. We would hear that familiar tune playing on a hot summer day when the truck was still blocks away and be filled with such a longing for that smooth, cold ice cream. I still remember how much I resisted taking that first taste, knowing I would be ruining the perfectly formed swirl of creamy goodness. We were equally adoring of other swirly, soft ice creams such as the Twin Kissed variety found on the Wildwood boardwalk, only that one had vanilla AND chocolate swirled together in one which seemed like absolute magic! I don't know why these food icons, which were a popular type of advertising in the 1950's and 1960's continue to have such a powerful hold over me and and my artwork. I think there is something very profound about the personification of inanimate objects and animals especially to children. I know that believing my teddy bears had feelings and personalities gave me a great sense of comfort and security. Now as an adult I still feel cheery when I see my salt and pepper shaker faces looking up at me from my kitchen table at breakfast! We can all use a little encouragement in the morning to begin our day on a cheery note. I'm hoping my newest anthropomorphic print will do the trick. This combines two of my favorite subjects: anthropomorphism and vintage kitchen! It is now available in The Curious Kitchen shop on Etsy and I'll soon be adding small prints of the individual characters . Next week I'll be running a contest to win an 8 x 10 print simply by sharing the link on Facebook, Twitter or Pinterest so check back for details.